The Sense of Hearing is a truly accessible introduction to auditory perception, addressing the fundamental aspects of hearing. Thoroughly revised throughout, this edition reflects recent discoveries in the field, and includes additional coverage of the neural basis of hearing. The book introduces the nature of sound and the spectrum, and the anatomy and physiology of the auditory system, before discussing basic auditory processes including frequency selectivity, loudness and pitch perception, temporal resolution, and sound localization. Subsequent chapters show how complex processes such as perceptual organization, speech perception, and music perception are dependent on the initial analysis that occurs when sounds enter the ear. The book concludes with coverage of how hearing impairment can provide an insight into disorders of the auditory system. 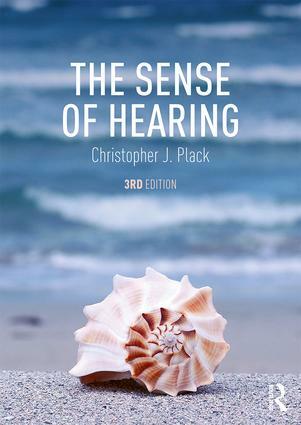 Featuring student-friendly resources including an overview of research techniques, an extensive glossary of technical terms, and over 150 original illustrations, The Sense of Hearing offers a clear introduction and an essential resource for students and educators involved in this challenging field. 6.3 How Is Sound Intensity Represented in the Auditory Nervous System? 7.2 How Is Periodicity Represented? 7.3 How Is Periodicity Extracted? 12.7 Why Does Music Exist? 13.1 What Is Hearing Impairment? Christopher J. Plack is Ellis Llwyd Jones Professor of Audiology at the University of Manchester and Professor of Auditory Neuroscience at Lancaster University.